VTV.vn - Vietnamese water puppetry will represent the national performing arts at the International Theatre Festival of Kerala (ITFoK), which will be held from January 20 to 26 in India. An 11-member troupe from the Thang Long Puppetry Theatre will perform traditional acts at the festival, according to the theatre’s Vice Director Chu Luong. 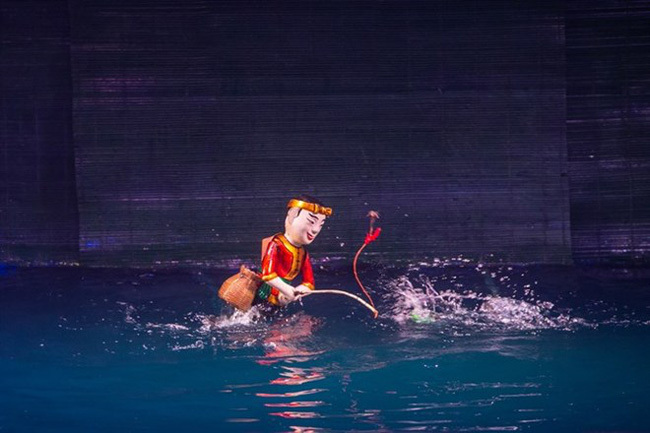 “Water puppetry is one of the attractive performing arts of Vietnam that foreign visitors always want to discover,” he said at a press conference held on January 16. "We will bring all the props and equipment to set up a water puppetry theatre at the festival," he said. In addition to performing, Vietnamese artists will join exhibitions and seminars to introduce the art form to international audiences and experts. Le Quy Duong, a member of the Executive Council of the International Theatre Institute, said he was happy to connect the festival organisers with the Thang Long Puppetry Theatre. Duong said the festival provides an opportunity to promote the quintessence of Vietnamese culture and traditional art. Founded in 1969, the Thang Long Puppetry Theatre now is a must-see place for tourists in Hà Nội. It was certificated by the Asia Book of Records as the longest-running theatre of traditional water puppet art by doing four to six shows every day since 1994. The first edition of ITFoK was held in 2008. Festival director Arundati Nag said it was great to discover that world theatre is alive and well across the continents. “Every nation has its own specific theatrical performing traditions, which incorporate a continuous chain of cultural history, connecting our past to the present, celebrations of life’s joys, sorrows, oppressions, victories, defeats and challenges,” she said.